Icons. From the early days of organized religion in the western world, the subject of icons raised considerable debate. Nope, not going to go into the theological debate here. But, for some of us, the religious icon holds a place in our hearts. As any other work of art, icons evoke emotion but also, they serve to instruct. Times change though, so looking at icons today is different than, say, one hundred years ago because we look at the world a little differently. Looking at this image of the guardian angel, for instance. When I was a kid, I believed that there was indeed a guardian angel watching over me. Really believed. I even resisted doing things if I thought my guardian angel would not approve. I remember talking to her as well. All in all, my guardian angel was a comfort to me, until I was in high school. This guardian angel is peaceful and the scene is bucolic. Until we look closer and see the children are very very close to the edge of the precipice. Most parents in today’s world would not feel comforted knowing that a guardian angel stood between their children and the edge of and cliff. Most children today do not know about guardian angels. Well, the most that I can say is that my grandchildren do not know about guardian angels. I suppose it is pretty old school to believe that a spirit world is here on earth interceding for us and protecting us in our everyday life. Very old school . . . In researching this image, I failed to find the artist (If you know let me know!). 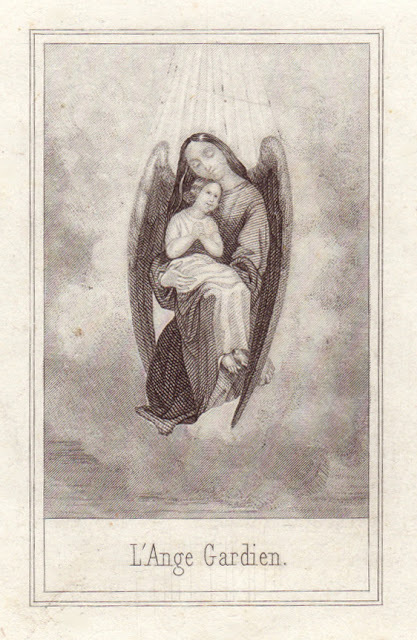 But I did find a website devoted to Holy Cards – and they are exquisite! The notion of guardian angels is an old one. As one example, in the seventeenth century, Francis de Sales addressed his followers, “Make yourself familiar with the Angels, and behold them frequently in spirit. without being seen, they are present with you.” Thomas Aquinas who wrote the Summa Theologica, you might say, had two feet on the ground – he wrote philosophical tracts and if not for his timely death certainly would have been excommunicated because he followed Aristotle. But still, he believed that guardian angels served to instruct us on our journey through life. There was a survey in Britain about guardian angels – the question posed, Do you believe in guardian angels? Not surprisingly, most of those who responded did not. I love the idea of a guardian angel but do I really believe there are guardian angels? Not in the same way as I did when I was a child. But I really like the idea . . . . The print reminds me of this beautiful idea – true or not. The print is soft and lovely and comforting to think about . . . even in the midst of the craziness of the Flea Market where I found it!